Hunting is something that has always been a part of my life. That may not sound strange to some, but to my girl friends, it’s just plain “weird”. I have been going hunting with my dad since I was five where I would, inevitably, fall asleep in the stand. When I was ten years old, I started turkey hunting with a shotgun and killed several birds over the next few years. I shot my first deer when I was thirteen with a borrowed .243 rifle. He was a nice nine point buck, but I thought the rifle and shotgun made it too easy and wanted to start bowhunting. When I received a Parker Challenger bow for my fourteenth birthday, I decided to bowhunt for turkeys. This was definitely more of a challenge than the shotgun, but I was still able to take six turkeys and it helped me stay ready for deer season. I shot a buck in each of the last three bow seasons, but 2007-my senior year in high school- was different. This year some really nice people gave my dad permission to hunt their property, but it was after the season had already opened so we did not have much time to scout. But we found a “funnel” that had oak trees loaded with acorns, connecting two large bedding areas. We put up a stand on each side of the “funnel” anticipating a chance at a buck. My dad saw several big bucks running that area and we both decided to hold out for one of them. On the first few trips, I had the opportunity to shoot several decent eight and ten point bucks but knew that there were bigger ones and decided to pass. November 10, 2007 was a day like no other. Using my flashlight, I found my stand, climbed in and got my bow ready. It was a perfect morning with cloudy skies and a cool breeze. I knew the deer would be moving that morning but for the next hour and a half, all I saw was a black squirrel run up and down the tree in front of me gathering his acorns. However, at 8:40, a doe stepped out of the trees behind me and to my right. Thinking a buck might be with her, I got ready for a shot. A few minutes later, a small eight-point stepped out and started chasing her. After they disappeared into the dense brush, a spike buck came out and walked under my stand to eat acorns. As he was eating, “the giant” stepped out. When he saw the “spiker” he bristled up and strutted over as if to show him who’s boss. When he reached ten yards, I let my arrow fly and I knew as soon as it hit that it was a fatal shot because of the way he ran off at a pounding, dead run, swaying from side to side. Shaking, I called my dad on the radio saying, “I shot him! I shot the giant!” After waiting about thirty minutes, we went to look for him. It was very hard following his blood trail because the entrance hole was high and the arrow hit bone on the opposite side preventing an exit hole, and so there was very little blood to follow. We lost his trail at a creek only sixty yards from where I shot him. We didn’t know if he crossed the creek or turned and followed it north. My dad thought he may have crossed the creek so that’s where we went first. After going about eighty yards up the hill on the other side of the creek my dad started doubting the direction we had chosen, so we went back to the creek to try looking in the other direction. With no luck, my dad was convinced that we gave up too soon on our first choice, so we went back up the hill to continue our search. After going only twenty yards past where we gave up the first time, my dad waved me over and said he found blood. I was excited he found blood, but a little worried that the buck had made it this far. Then I looked up and saw the blood that my dad had found, ten yards up the hill, under a cedar tree was the biggest buck I’ve ever seen. We were both relieved, excited, and grateful. After taking a moment to thank God for this incredible gift we went to work field dressing him. I saw then what my Thunderhead broadhead did and why my dad has been shooting them for so long. My buck was a mainframe ten-point with six extra points, and has an unofficial gross score of 182, but will probably net in the low 150’s. After we have him officially scored, my dad and I together will mount him, and I have a special place on my bedroom wall reserved just for him. 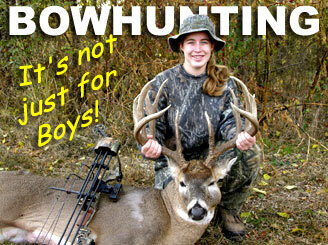 Please Join us in Congratulating Erin on her fantastic buck !! While I was admiring my trophy, I saw an unusual lump on the left side of his face that almost swelled his left eye shut. The veterinarian I work for said that it is called “Lumpy Jaw” in cattle and is caused when the animal is eating and a foreign object gets stuck in its cheek and works its way into the tissue, carrying bacteria causing infection and swelling. Hunting has always been a part of my life. My dad has always encouraged me to reach for my dreams, even if they weren’t his own, but this one we share together. It’s my senior year and next year I go off to college and the studying will begin. But I’ll always have this special memory with my dad and what he taught me: with hard work and determination I can do anything, and------that bowhunting is not just for guys!